Turkey’s active involvement in both Syria and Egypt undermined its plans to become a regional leader. Now, far from having “no problems with neighbors,” Ankara is trying to renew ties with the West to counter rising pressure from the East. Presidential spokesperson and foreign policy adviser Ibrahim Kalin famously tweeted two years ago that Turkey’s apparent isolation in the international arena was a “precious loneliness”. According to his line of reasoning, all others would eventually come around to Turkey’s position, realizing that its moral stance was the right place to be. The tweet was prompted by intensifying criticism, both domestic and foreign, of the Justice and Development Party’s (AKP) foreign policy. Turkey lacked ambassadors in three Middle Eastern countries (Syria, Israel, and Egypt), a number that would later increase further (Yemen and Libya), and its relationships with the EU and the United States were deteriorating. Then-Prime Minister Recep Tayyip Erdogan’s apparently successful meeting with US President Barack Obama in Washington in May of 2013 was overshadowed by a very public difference of opinion concerning Syria, and Washington shunned Erdogan following the Gezi protests and subsequent police violence against demonstrators in June of 2013. A “model partnership” became a model transactional relationship. In the case of Syria, Ankara’s overambitious policy did more than just polarize Turkey internally – it also placed it squarely in the middle of the civil war. Not only did Turkey sponsor and host the first civilian opposition group, the Syrian National Council, it also let the Free Syrian Army maintain its headquarters in Turkish territory when relations with the Assad regime fell apart. As the Syrian conflict dragged on and the nature of the opposition groups changed, with radicals and jihadists gradually rising to the forefront, Ankara continued its policy of supporting all groups fighting the Assad regime. As a result, Erdogan’s pursuit of hegemony in the Middle East led his government to do a complete about face on most established tenets of Turkish foreign policy, abandoning the “no problems with neighbors” principle entirely. When the Syrian civil war quickly turned into a brutal geopolitical contest between Saudi Arabia and Iran manifested by intense sectarian violence, Turkey inadvertently became part of the rift. Many reports exposed the activities of the so-called “Jihadist Highway” used by foreign fighters going to Syria to join the militia of their choice. The Turkish press identified recruitment offices of the Al Qaeda-affiliated Nusra Front within Turkey and reported on families that had lost children to the jihadist cause. These stories showed the presence of local support networks, including facilities to treat fighters in Turkish hospitals near the border and pathways to purchase oil from the so-called Islamic State (IS). Meanwhile, turning to Egypt, Prime Minister (today President) Erdogan was a relentless critic of Egypt’s military coup and its leader Abdel Fattah el-Sisi, questioning the democratic credentials of all the countries that openly or discreetly supported the overthrow of the Muslim Brotherhood government of Mohamed Morsi. In light of the Gezi tragedy, however, Turkey’s criticism seemed increasingly hypocritical. In fact, the deterioration of Turkey’s liberal credentials has accelerated since Gezi, as the norms and institutions comprising “the rule of law” have been dismantled and freedom of expression and association jeopardized. All this suggests that the much-ridiculed concept of “precious loneliness” did not just represent a futile attempt to salvage government policy from a judgment based on its own ruinous consequences. It also reflected a deep, if unrealistic, desire to make Turkey an autonomous agent in the neighborhood. Erdogan’s entertaining the notion of joining the Shanghai Cooperation Organization rather than the EU, although manifestly absurd, was symptomatic of this uneasy shift. In short, the AKP government has been reluctant to accept that its policies, especially following the Arab Spring and the Syrian crisis, effectively undermined Turkey’s standing in the region. Ankara was right to support the democratic aspirations of “Arab spring” protestors, and its desire to help democratic experiments succeed was honorable. Yet ignoring the strategic realities of Middle Eastern dynamics and overestimating Turkish influence ultimately doomed the project. The ideological dream of rectifying the consequences of Western imperialism in the Middle East in favor of an Islamic bloc undoubtedly had an intoxicating effect. The insistence on supporting the Muslim Brotherhood in Egypt and elsewhere brought the resentment of the Gulf countries and other Arab political movements upon Turkey. Turkish-Saudi relations only thawed after the death of King Abdullah and the ascension of King Salman, who took a more accommodating view regarding cooperation with Turkey. In the end, Turkey’s aspiration to become the leader of a resurgent Middle East ended up with Ankara finding itself awkwardly playing second fiddle to a Saudi Arabia determined to contain Iran. Diplomatically, Turkey was embarrassingly demoted from being the secular-democratic “model” for Arab countries to being seen as yet another patron of radicalism loathed around the world. In this reading, Turkish foreign policy started unraveling in earnest after IS captured Mosul. During its so far 13-year rule, the AKP government broke Turkey’s taboos on dealing with Kurds domestically and in neighboring Iraq. Domestically, Turkey started abortive negotiations in 2009 with the communist Kurdistan Workers’ Party (PKK), which has led an insurrection against the government for the past 30 years. Then, after another bout of intense fighting, the AKP government started negotiations with the PKK’s incarcerated leader Abdullah Öcalan and declared the beginning of a peace process with the Kurdish political movement in the winter of 2012. The ceasefire that started then held until July of this year. Turkey’s motivations were clear: the PKK’s affiliate Democratic Union Party (PYD) is the dominant political force in the Kurdish Rojava region of Syria, and, with the support of the US Air Force, the most successful fighting force against IS thus far. With Iraqi Kurds, the AKP government established a close working relationship, even hinting that Ankara might not mind a declaration of independence by the Kurdish Regional Government ruling northern Iraq, once an unthinkable position. Ankara fostered business deals, investments, transportation links, and oil trade in Kurdish Iraq, led by President Masoud Barzani and his Kurdistan Democratic Party, and integrated the economy of the region with Turkey’s – partly in response to Iran’s influence over Iraqi Shias. When Mosul fell, IS took diplomats and personnel of the Turkish Consulate hostage – and with them Turkish foreign policy. When ISIS unexpectedly turned towards Erbil, the capital of Iraq’s Kurdish north, Barzani looked to Ankara for help without avail. The US Air Force then started bombarding IS positions and helped the Kurdish Peshmerga fighters turn the situation around. In Shingal, the PKK (normally as much Barzani’s archenemy as Ankara’s) played an important role in staving off IS while also saving the embattled and uprooted Yazidi population from genocide. Turkey lost much of its credibility as a regional power. Although Turkish help was dispatched later, Iran capitalized on this misstep and provided weapons to Barzani itself. With Iran making further inroads into Kurdish politics, the United States returned to the Iraqi theater with the blueprint of an anti-IS coalition, one Turkey did not at first join; in fact, Turkish policy and behavior have led to a perception that the AKP favored IS over the PKK and PYD. This impression was strengthened when IS attacked the predominantly Kurdish city of Kobane in the Rojava region. The Turkish government, having accepted nearly 200,000 refugees who had fled the city and its surrounding villages, stood idle as IS forces besieged and nearly conquered the border city. A comment by Erdogan (“Kobane is about to fall”) triggered two days of violent riots in Turkey’s Kurdish provinces. Kobane persevered, thanks once more to the US Air Force, but for all intents and purposes these developments brought to an end Turkey’s hegemonic aspirations. The United States and Turkey finally agreed at the end of July 2015 to open Incirlik Air Base to coalition forces bombing IS positions in Syria and Iraq. This agreement, long sought by the Americans, is an important sign that Turkey is at last lowering its expectations regarding its autonomy and hegemony. In fact, Ankara is repositioning itself as much in response to regional developments as to its own growing estrangement from its Western and regional allies – save for an alliance of convenience with Saudi Arabia and a special relationship with Qatar. The finalization of the deal must also be seen in light of the Iran nuclear agreement, which is certain to alter the strategic framework in the Middle East. Turkey is looking to strengthen its own positions in the region, while the United States needs reliable allies to contain Iran. 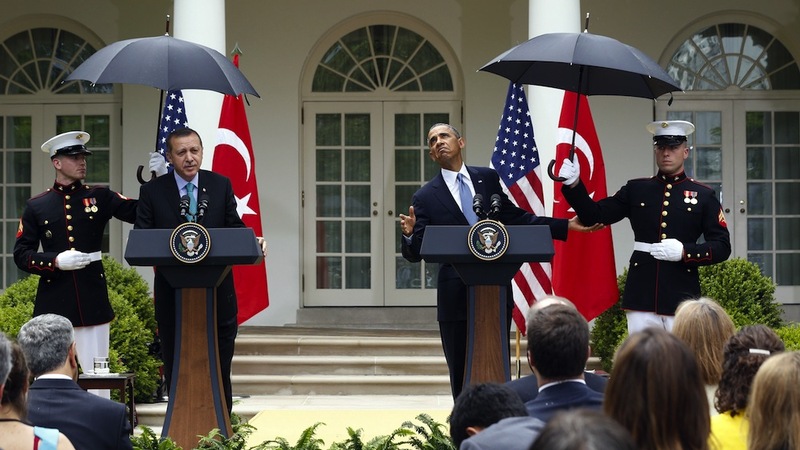 Obama, however, has publicly complained about Turkey’s less than satisfactory efforts to oppose IS, and Turkish-American relations were already at a critical juncture by the time the agreement was finalized. With the agreement, Turkey declared its strategic choice to stick with the Atlantic alliance, and particularly the United States, despite strategic differences. Yet developments suggest that Ankara has ulterior motives for its cooperation. A few days after reaching agreement with Washington, the Turkish Air Force bombarded IS positions in Syria after IS fighters killed a Turkish soldier on the border, and there were waves of arrests of known IS militants in Turkey. However, Turkish fighter planes also bombarded PKK strongholds in Iraqi Kurdistan a day after the limited assault on IS in retaliation for the murders of three Turkish policemen by the PKK. As things stand, Turkey finds itself in an escalating round of hostilities with the PKK. The sweeping arrests that began on July 20 appear to be directed more against the civilian, PKK-affiliated People’s Democratic Party (HDP), which won 13 percent of the vote and 80 seats Turkey’s recent parliamentary elections. On September 9, a number of HDP offices were firebombed. The move to firmly join the coalition against IS was an important step for Ankara. Yet the Turkish government obviously still does not share the concerns of its allies. Although the West has grudgingly tolerated attacks against the PKK itself so far, the PKK-affiliated PYD and the armed YPG in Syria are considered off-limits. Therefore, another motivation for Ankara to join the coalition was to undermine the status of Syrian Kurdish forces as indispensable allies of the US effort to “degrade, and ultimately destroy IS.” In the absence of any other effective ground forces that can beat IS, the Kurds will remain protected by American firepower. In this context, the final goal of Turkey in joining the coalition was to block the western extension of Kurdish-held territories to the west. This is what the 60-mile wide, 30-mile deep no-fly zone is meant to accomplish: Turkey would like to empower the Turkomans living in the territory while also sending some of the 1.9 million refugees back to Syria. If Turkey continues to prioritize its fight against the PKK over the fight against IS, the bond that was re-forged through the deal on Incirlik may yet unravel.